"You" is an album of contrasts and leads the listener along carefully selected levels of suspense through the full gamut of the Arafna-esque art of sound creation. The spectrum extends from dark jewels which permeate nerve and brain, to great boulders which avalanche their way through the intestines. A peculiar hybrid of various Industrial Music styles forming a malicious monster, remarkable for its changeability and the unexpected. Difficult to control, cunningly applied analogue electronics meet sawing Angst-synthesizer ensembles ingeniously accompanying scream, -speech, -distortion vocals to the beat of noise and steel. 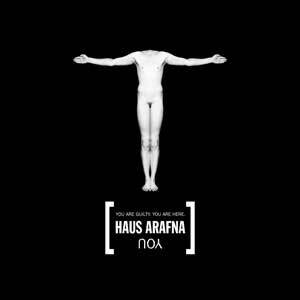 That has proved itself, but today’s music from Haus Arafna is generally more advanced, more to the point. All probably created just for "You".